Councillor Botting is available by letter, e-mail or telephone. Kim was elected as an Orpington Ward Councillor in 2014 and enjoys representing the ward. Kim has lived in Orpington for 40 years now. A retired Police Officer of 38 years’ service, she reached the rank of Chief Inspector. Kim's role on the Council is serving on Public Safety and Protection Committee, the Education, Children and Families Select Committee, the General Purposes and Licensing Committee, Licensing Sub- Committee and the Full Council. Kim is also BTTA Town-Twinning Representative. Kim sits on the Safer Neighbourhood Panels of Orpington and Chelsfield. Kim is also Chairman of Neighbourhood Watch where she lives and sits on the Green St Green Village Society Committee. In 2015, Kim received a Public Nomination Certificate in the Partnership Category of the Local Government Achievement Awards. In 2015-2016, Kim was also elected Mayor of Bromley Borough for a year -raising £55,000 for her chosen charities of Bromley CONNECT and the National Brain Appeal. Kim is a Fellow of the Royal Society of Arts. Kim is a School Governor for Blenheim Primary School in Orpington. Kim is married with four grown up children and is devoted to family life. 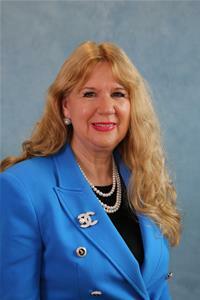 Councillor Kim Botting is the Mayor of Bromley for 2018/19 and further details can be found here.